This was the title of the workshop we held last Saturday in the Kala Sangam centre in the central Bradford. 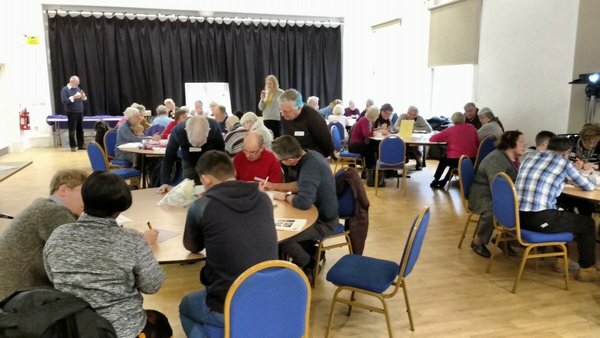 About 50 people turned up on a very wet morning to examine in some depth different aspects of family poverty and what is already being done and what more could be done. Liz Firth led everyone in an exercise in budgeting on a limited income. This was just to tease out some of the issues that people living on a low income face every day: hard choices (or little choice) about how their money is spent. We followed this with some short video clips to hear the voices of people who have to live on low incomes. Some of these voices related problems they had encountered with the new Universal Credit. To follow these up there was a short presentation about Universal Credit from Pauline Crawford of Incommunities. Incommunities is a Housing Association managing some 20,000 properties –mostly in the Bradford District. In communities, and other Housing Associations, are spending a lot of resources in preparing for the rollout of Universal Credit so that they can help their tenants in whatever way possible to ensure they get the money to which they are entitled. You can understand this concern for tenants when you realise that the average household income across the UK is £38,000, the average in Bradford is about 10,000 less and the average household income for a tenant of Incommunities is £17,300. This rollout of 6 benefits into 1 monthly salary-like payment (where the recipients generally have to budget for the different types of spending) represents a significant risk to their rental income. The pilot areas for Universal Credit have shown that debt levels of tenants increase significantly when they are put onto it. Pauline was also able to provide a number of other disturbing statistics (for instance, about the increases in the number of people being sanctioned with Universal Credit or the commitments that people who are already in work have to make in order to avoid being sanctioned (which results in the loss of all or some benefit for a period of time). It’s fair to say that most people attending had no idea about many of the ramifications of its introduction or the impact that it is going to have on families in poverty where at least one person is working (which is the majority of families in poverty). The phased rollout of Universal Credit hits Bradford in June 18, Leeds in Oct and it has already been rolled out in Kirklees and parts of N Yorkshire. The morning session had been entitled ‘From Awareness to Solidarity’. The questions that people asked Pauline at the end of her presentation showed the solidarity that people were feeling towards the loss of human dignity that people applying for these benefits have to suffer. In the afternoon we wanted to focus people more towards what they could do and attendees selected two workshops to attend. Working in small groups again, people heard about refugee and migrant action, various mechanisms for supporting families to stay together, dealing with debt and debt advice and aspects of food poverty. These sessions were made possible by people with specialist knowledge and experience making their time available. These included Lucy Irven (the Diocesan Refugee Support worker), Bernie Jackson (Leeds City Council), John Sheen (Manager of the Rockwell Centre on Thorpe Edge estate in Bradford), Dave Paterson (Unity Poverty Action), Pat McGeever (CEO of Health for All, Leeds), Angus McNab (Trussell Trust) and Paul Grafton (SVP). We are very grateful to them all. 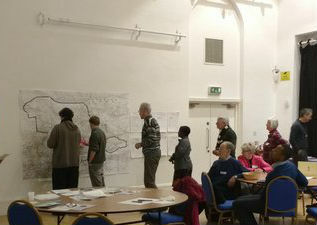 After this Tom Chigbo (organiser for Leeds Citizens and parishioner in the cathedral parish of Our Lady of Unfailing Help) and Dave Paterson spent time encouraging people to take their action up a level by speaking to the people with the power to make lasting changes – MP’s and local councillors. Prior to a final liturgy people were asked to spend five minutes reflecting on what actions they could personally commit to do as a result of coming along to this workshop. As part of the final liturgy people came up and stuck these onto a giant map of the Diocese. Although many of the things we found out during the course of the morning were quite shocking, the afternoon encouraged everyone that they could play a part in helping to make lasting change happen.